Freedom and civilization are the products of middle-class values and activities, and those who question those values are enemies of society'--such is the tired and outworn conclusion of this tired and pretentious tract. Johnson, a former editor of The New Statesman, begins with a historical argument that appears promising, if eclectic and rather superficial. He traces European history from the Greeks to the Industrial Revolution, arguing that each stage in this development was propelled by the innovations and dynamism of the urban middle class, and that each stage declined or fell with the circumscription of middle-class freedoms. With the full development of a market economy, Johnson proceeds, the middle class has been able to avoid this fate in the modern epoch--at least until now--and has produced a sustained period of development and growth. This interpretation is certainly debatable--and worth debating--but any logical basis for discussion becomes utterly lost when Johnson abandons history and move to his real task: the defense of our received civilization against its enemies, whom Johnson simple-mindedly classifies as Freudians and Marxists. Taking up, as a cudgel, Karl Popper's conception of scientific verification through the criterion of falsifiability (The Logic of Scientific Discovery), Johnson attacks his opponents for their quasi-religious irrationality. His prose degenerates into ugly rhetoric such as student Fascist Left, and he adopts vaguely racist epithets like witch-doctor when referring to his targets. 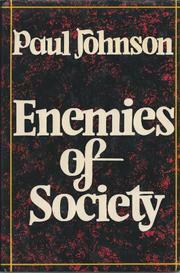 Like his hero Popper (in the latter's The Open Society and Its Enemies), Johnson is unable to distinguish between theories and variously attacks Herbert Marcuse, Marshall McLuhan, Ivan lllich, Freud, Levi-Strauss, and sociology tout court, employing the same insubstantial criticisms throughout. Occasionally slipping into hysterics, this book merely updates Popper's questionable work without adding any sustained theoretical content.